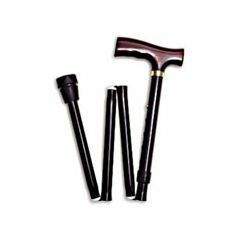 The Folding Travel Canes by Mountain Properties are made of a strong, lightweight aluminum cane with solid maple wood handle and durable rubber tip. The Folding Travel Cane folds into compact 11" x 5" plastic carry case which is included. These Folding Travel Canes are adjustable in height from 33" - 37". Fold: Pull on the tip and separate the segments. Unfold: Simply remove from case and let fall naturally. It will click into place. Lightweight. Easy To Use. Well Constructed. Safe. Supports Weight. Stores Easily. Outdoors. Wet Weather. Long Distances. Indoors. Short Distances. Elderly. Medical Professional. Short Term User. Use on travels on uneven surfaces.Easy to pack. Very good support cane. Excellent item for folks that don't want to carry around a cane all day and just need it for stairs. Stores Easily. Lightweight. Easy To Use. Overpriced. Cheap Looking and Feeling. Poorly Constructed. Long Distances. Outdoors. Wet Weather. Short Distances. Indoors. I bought this product from this site because it was a medical supply store and I figured they would have good quality products. I found many similar canes for more than half the price elsewhere but figured this was a better cane. However, when I received th cane the really cheap looking cane wasn't worth the price and looked similar to other canes I've seen that are much cheaper. I would not buy this product again at this price. I am highly disappointed at Allegro and this product. Well Constructed. Stores Easily. Easy To Use. Lightweight. Safe. Supports Weight. I am glad I made this purchase. by Greg R. from Irvine, CA. Safe. Well Constructed. Supports Weight. Lightweight. Easy To Use. Stores Easily. Outdoors. Indoors. Long Distances. Short Distances. Wet Weather. Great for running around town in my auto.Foldup makes it easier to store.Got many compliments on the colors of the cane.Most important was the handle that fit nicely in my hand.Curved handle canes hit pressure points in the hand making it sore over a long peroid of time.No one beat your price on the internet.Delivered it an amazingly short time.Keep up the great work. by Genny B from Boston,Ma. I am 5'5" and my adjustable cane is on the next to last last hole. The shortest hole only takes it down another three inches so I would think it would only work for people 5'2" and over. I think you would either need to get a pedriatric cane or one that is cut to measure for you. I am 5'1" and have recently used my adjustable cane daily on a month-long tour of Italy. Absolutely love it. I found it so convenient that it would collapse small enough to fit in my shoulder pack so it would not get in people's way on the bus or train.